Pioneers in the industry, we offer wheeled waste bin, wheeled waste bins, plastic wheeled bins, waste bin with foot pedal and wheel, hospital wheeled waste bin and plastic waste bin with foot pedal & wheel from India. 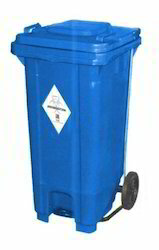 We are offering Wheeled Waste Bins. To meet the exact requirements of clients. These products are well acclaimed by our clients for its eco-friendly and cost efficient features. These are developed from finest quality raw materials to ensure durability and reliability. Foot Pedal for hands free opening & closing of lids. Available color red, blue, yellow, green & greyblack. 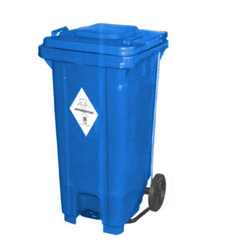 We are involved in offering a wide array of Waste Bin with Wheels and Paddle that is manufactured using high-grade raw material and the latest machines with the set universal standards. These products are examined upon various parameters under the strict vigilance of our skilled professionals to ensure defect-free deliveries. In addition to this, these products are available with various options and can also be customized as per various specifications of our valued clients.